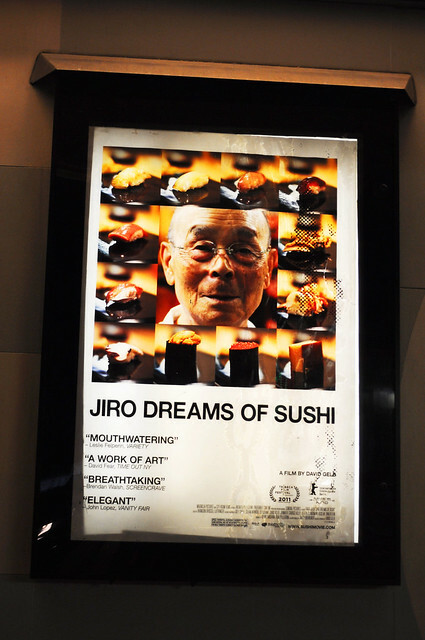 After an interesting dinner at Sushi Azabu, Lisa and I headed over to the West Village to the International Film Channel (IFC) Center to finally see the film we'd been talking about for the last couple months -- Jiro Dreams of Sushi. We had heard so many wonderful things about this -- through Gilt Taste, The New York Times, and NPR at first, and waves throughout the foodie universe thereafter. Watching the trailer alone is magical, enticing, and delicious -- you couldn't help but be curious as to what the documentary was all about. 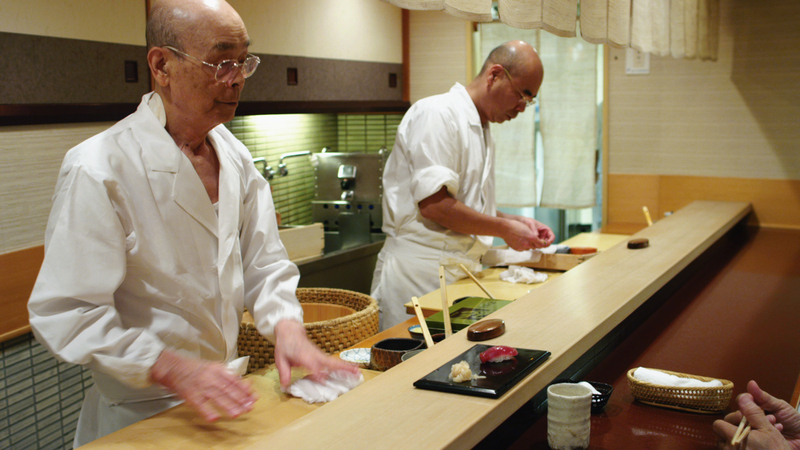 The documentary tells the story of an 85-year-old sushi chef (well, not just any sushi chef), Jiro Ono, who is the proprietor of Sukiyabashi Jiro, a ten-seat, sushi-only restaurant located inside a Tokyo subway station. "Despite its humble appearances, it is the first restaurant of its kind to be awarded a prestigious three-star Michelin review, and sushi lovers from around the globe make the repeated pilgrimage, calling months in advance and shelling out top dollar for a coveted seat at Jiro's sushi bar." The experience is rumored to outweigh its hefty cost -- so if you ever find yourself seated at Sukiyabashi Jiro, it'll be the most you'll ever spend for a meal under a half hour (i.e., eighteen or so pieces of nigiri sushi in 20-25 minutes for a whopping prix fixe price of 30,000 ¥ -- about $275). It's certainly a quick-paced marathon. 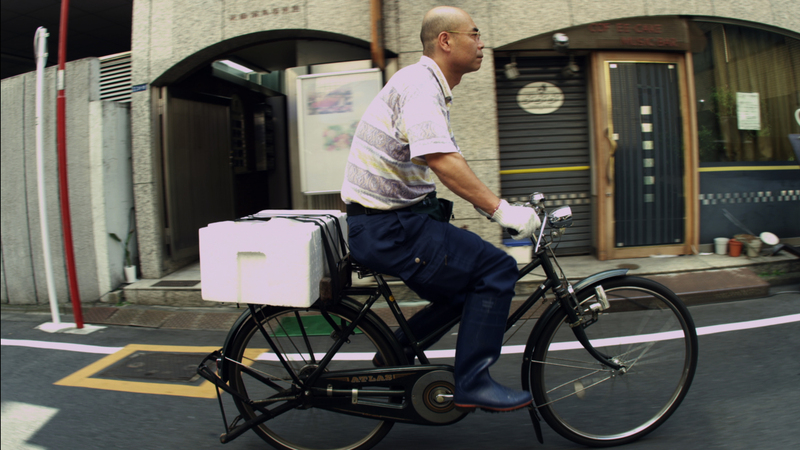 Jiro has been working most of his life, and he doesn't plan on stopping anytime soon. Throughout this time, he has been "mastering the art of making sushi, but even at his age, he sees himself still striving for perfection, working from sunrise to well beyond sunset to taste every piece of fish; meticulously train his employees; and carefully mold and finesse the impeccable presentation of each sushi creation." It is even said that among "a delegation of revered sushi chefs" that Jiro is the clear lead, who they claim, with no hesitation, has "mastered rice." 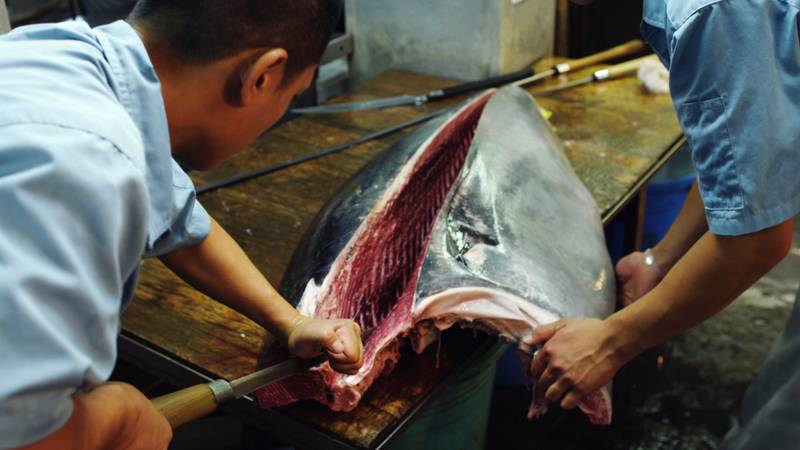 The documentary, directed by David Gelb, begins by introducing Jiro and his famed restaurant, going into the sushi chef's process in preparation and execution. The camera took you to the Tsukiji Market, where each morning, Jiro's eldest son, Yoshikazu, visits to check out and shop the daily catch for the restaurant's next day or two. The most striking is the intense tuna auction to buy all cuts of Bluefin tuna. The auction is another art form in and of itself. The documentary also details the relationship that Jiro has with Yoshikazu, "the worthy heir to Jiro's legacy, who is unable to live up to his full potential in his father's shadow" -- he's 50 years old now and remains the father's right hand man. It is tradition in Japan that the eldest son take over the family's business (in this case, Jiro's restaurant). On the other hand, Jiro's younger son, Takashi, opened a restaurant of his own, the sister to Jiro's restaurant, Sukiyabashi Jiro Roppongi (as it is located in Roppongi Hills, Tokyo) that has two Michelin stars and emulates a more casual atmosphere. Also featured in the film was Masuhiro Yamamoto, a famed food critic in Japan, who is Jiro's biggest fan. He does a lot of the story telling, sharing his observations with the revered sushi chef. A piece of o-toro -- fatty tuna -- created by Chef Jiro Ono. The progression of the film as well as a meal at Sukiyabashi Jiro paralleled themselves to an orchestra's performance -- it was quite extraordinary to watch the build-up of these progressive things within the hour and a half that we were seated in the theatre. 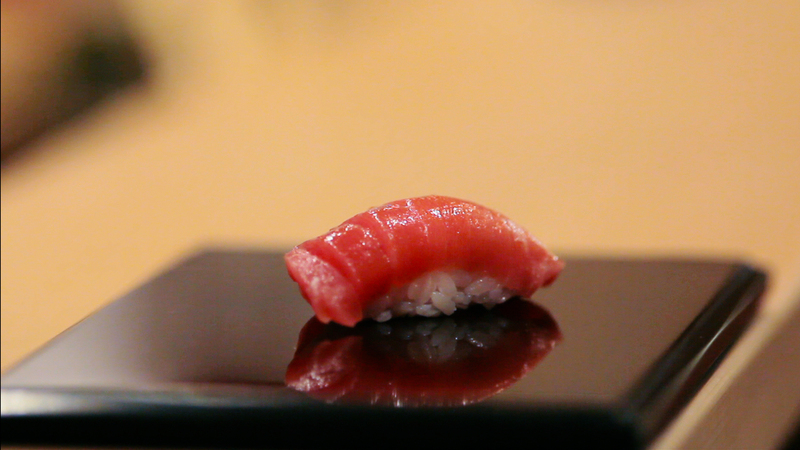 Even the soundtrack was beautifully done -- all classical masterpieces just like each crafted piece of sushi. More specifically, Mr. Yamamato outright says he views Jiro’s sushi meal "as a concerto with specific movements, or even as an illustration (and dramatization) of a specific philosophy." Another thing to note is that Mr. Yamamato, among other diners at Sukiyabashi Jiro, shared that every time he dines at the sushi bar (i.e., the first time and all subsequent times), he is always tense and nervous, which he speculates is because he's before the great sushi master of Jiro Ono himself. I find that really awesome that a chef can have a profound effect on such a noteworthy food critic as Mr. Yamamato. Jiro: "You have to fall in love with your work. You must dedicate your life to mastering your skill. That is the key to happiness." (from where the title of the film comes) Jiro: "I would make sushi in my dreams -- I would jump out of bed at night with ideas." Jiro (still obsessed with sushi-making): “If I stopped working at 85, I would be bored out of my mind." Mr. Yamamoto: "I’ve never seen a chef be so hard on himself." Mr. Yamamoto: "The only difference between Jiro now and forty years ago is that he no longer smokes." Jiro: "Even at my age, after decades of work, I don’t feel I have achieved perfection. But I feel ecstatic all day." Findings: Ultimately, this film that "chronicles Jiro’s life as both an unparalleled success in the culinary world, and a loving yet complicated father" is very inspiring both through its salivation-causing imagery and its embracing mantras. As the camera reels through each morsel of sushi, the result is simply delicious, and if you came to the cinema before a meal, expect to leave incredibly hungry. The tone of the film is honest yet light-hearted, especially with the pleasant classical music that haunts its musical score. Even as the dialogue is entirely in Japanese and communicated to the audience through subtitles, Mr. Gelb and his team were able to capture the humor, expressions, and art so very beautifully. You're definitely in for a treat with this film -- I loved it so much that I've already pre-ordered the Blu-ray disc for its release in July! Price point: $13 admission per adult.